Mike HongKei Sy, Jack Salt’s friend and biggest fan, reached out to the UVA community for help finding a place to stay in Minneapolis. He found an outpouring of support from Wahoo basketball fans and the alumni couple who put him up in their home. 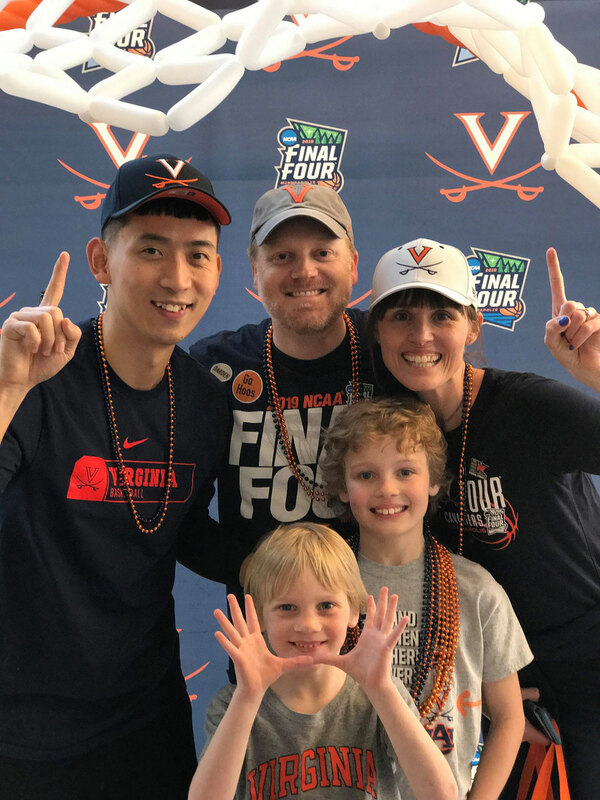 Thousands of University of Virginia men’s basketball fans flooded Minneapolis for the Final Four, but we think we’ve found the Cavaliers’ biggest fan – and it’s a guy from Macao. Mike HongKei Sy’s adoration for the team is not random. His story goes back six years, to a Nike-sponsored basketball camp in Guangzhou, China, where he served as a translator. 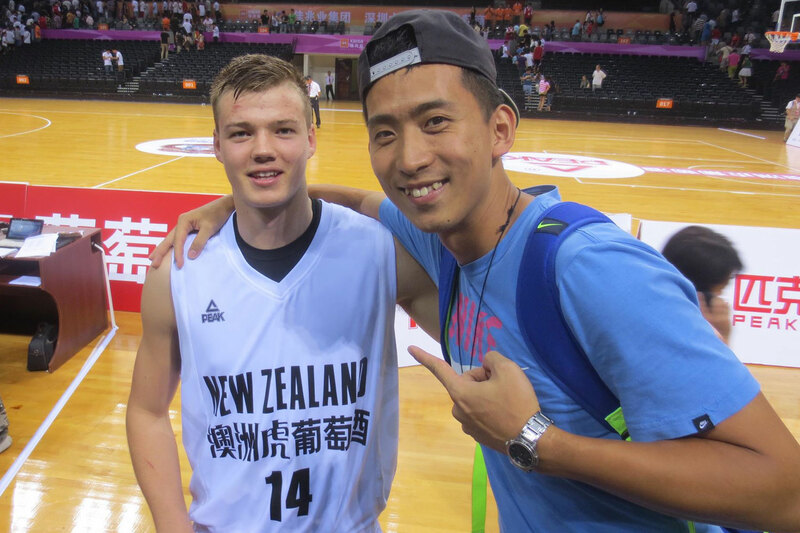 There he met a 17-year-old New Zealander named Jack Salt. Sy, then 29, said he was immediately taken by Salt’s athletic prowess and his integrity. 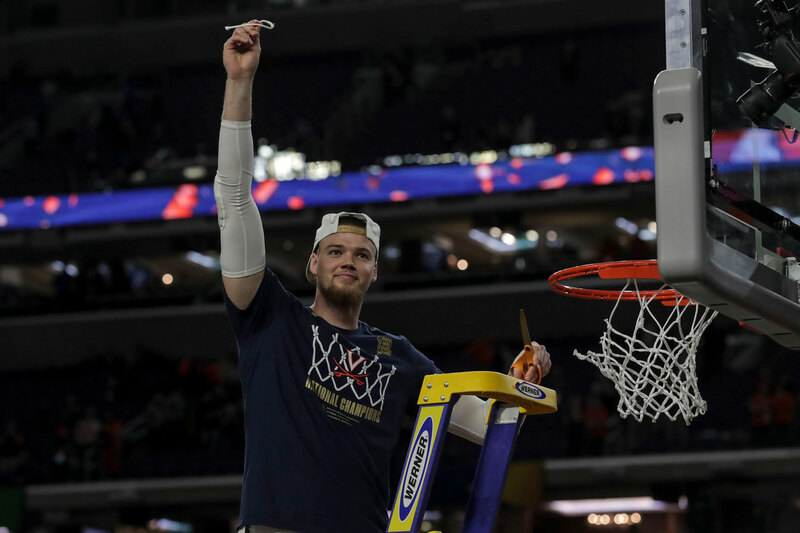 That was the beginning of a lasting friendship that inspired Sy’s epic journey to Minneapolis, where he witnessed UVA’s overtime victory over Texas Tech to become the NCAA champion for the first time on school history. 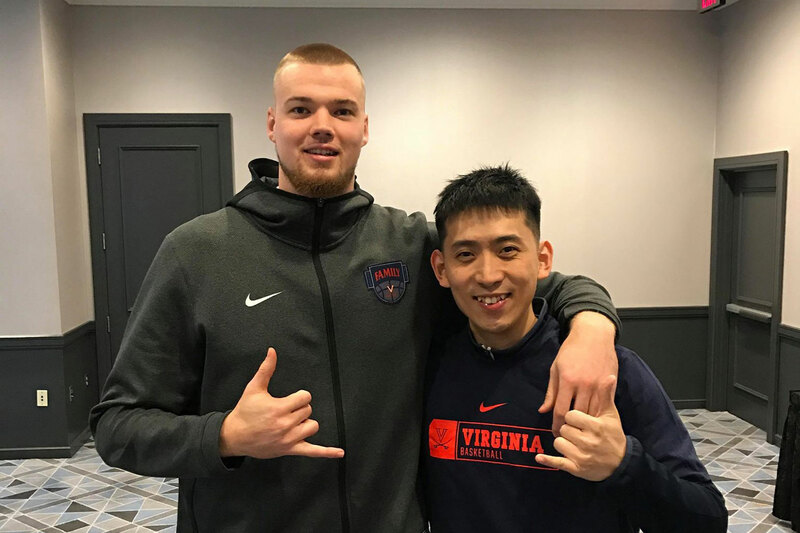 After watching the tournament’s first two weekends ravenously from Macao, Sy decided after UVA won in the Elite Eight round that he had to come to the United States to see how it ended. He messaged Salt, who offered tickets so that Sy could be seated behind the UVA bench with Salt’s family. There was just one problem: Sy had nowhere to stay. Enter the popular “UVA Hoops” Facebook group, with its 16,000 members (including family members of UVA basketball players). With just two days before the Final Four, Sy turned to the page for help; his budget could not accommodate the expensive hotel rooms and Airbnbs. Sy hopscotched from Macao to Hong Kong, South Korea, then Chicago and finally Minneapolis, clocking nearly 26 hours of travel. As he traveled the 7,500-mile route, he sought advice and received a loving embrace from the UVA community, which flooded him with suggestions and moral support. UVA alumni and Minneapolis residents Hillary and Cameron Wallace were watching the posts and decided they had to help. “People were really following his story and rooting him on,” she added. By Friday evening, they offered Sy their basement bedroom. They scrambled to get the room in order, even laying a UVA blanket and basketball on the bed. Early the next morning, Cameron headed to the Minneapolis-St. Paul airport to fetch Sy, who works with at-risk youth for the YMCA in Macao. Once he was settled at the house, Sy and the family were on the move. Hillary said they went to the team hotel several times so Sy could meet up with Salt. One of those visits ended with an incredibly sweet gesture. As the Wallace family, with 10-year-old Harry and 6-year-old Louie, waited downstairs, Sy went up to the team floor. “It was where the team and family members were staying, and Mike was sort of treated like a family member,” she said. Sy told Salt how welcoming the Wallace family had been to him. As he turned to head back down to meet them, Salt stopped him. “Jack said he wanted to give the boys basketballs,” Sy said. The 6-foot-10 center then grabbed two balls, signed them and asked Sy to give them to the boys. Salt and Sy pose on the team floor of the Marquette Hotel. Are You That Guy from Macao? If you haven’t figured it out, Sy is Salt’s biggest fan. He also traveled to see him play at the 2015 Charleston Classic. He is pictured here in 2013 with Salt at an international basketball invitational in Shenzhen, China. “When we were at the pregame event on Saturday, the rector of the University, Rusty Conner, came up to us and was like, ‘I hear you guys are hosting Mike from Macao,” said Cameron, who has two degrees from UVA – the first a double-major in foreign affairs and economics and the second an MBA from the Darden School of Business in 2008. Sy said before the final game he told Salt that the teams he has rooted for in other championship games always won. Hillary said she loves how sports can bring people together and give them faith at a time when the country is so fractured. “I feel like no matter what you look like, where you come from or what language you speak, you couldn’t believe the shared love and excitement that existed here. It was just totally exhilarating,” she said. “I am just grateful for having gotten the chance to be part of that with Mike, with our boys,” she said.